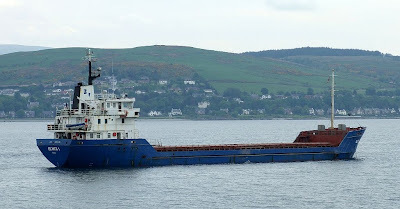 The coaster ELVITA 1 which was previously a regular caller at Sandbank, made a return visit to the Holy Loch today with another cargo of aggregates from Belfast. As the berth at Sandbank was occupied by RED BARONESS, loading a cargo of timber, ELVITA 1 had to spend the day lying at anchor at 'Bravo 4' before berthing in the early evening. She has recently been employed between Belfast and Ellesmere Port, with occasional visits to Ayr to load coal for Belfast. Great to see the BBC link, great stuff ! !